The first design for this villa was rejected by the local council. Disappointed by the subsequent modifications, the client, G. Manassen, sold the house while it was still under construction. Placed as far back as possible on the plot in a conciliatory gesture to the council, the house is still a typical Rietveld creation. It consists of two interlocking cubes. A large entrance hall stitches together the various household activities on the ground floor. The frontage is of white and glazed brick with white frames, the red and blue windows and doors acting as colour accents along with larger colour planes in the opaque areas. 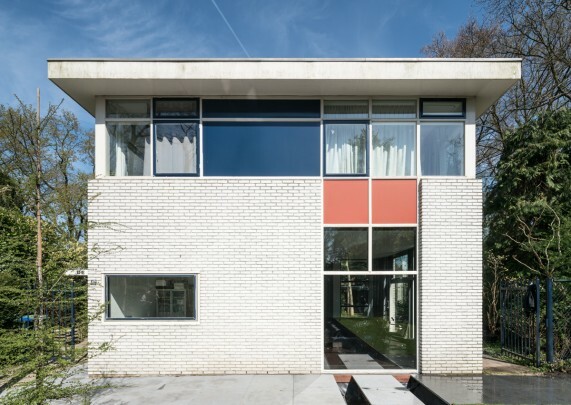 The composition of the frontage and the fenestration looks ahead to Rietveld's later work based on a grid of squares.